On Monday at MHS, senior Ciera Older signed her National Letter of Intent to join the Ohio Valley University softball team. Sitting in the front row, from left, are Melissa Lambert, Ciera Older and Chris Lambert. Standing in the back row are MHS athletic director Bryan Swann and travel ball coach Bryan Cooper. ROCKSPRINGS, Ohio — A hand-in-mitt fit, catcher’s mitt that is. 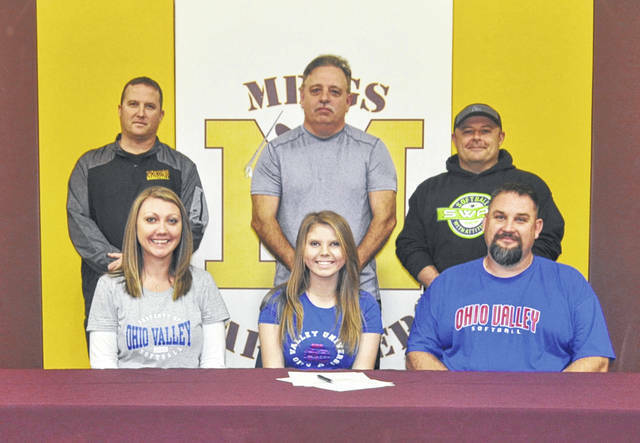 The Ohio Valley University softball team has a new catcher headed its way, as Meigs senior Ciera Older signed her National Letter of Intent to join the Fighting Scots on Monday inside Larry R. Morrison Gymnasium. Older — who has spent two seasons on the Lady Marauders varsity squad, with one still to come — talked about signing with the Division II school and how important it was to her to continue playing softball after high school. Older has helped the Lady Marauders to 32 wins in two seasons with the team, playing in 20 games as sophomore, before appearing in 17 as a junior. 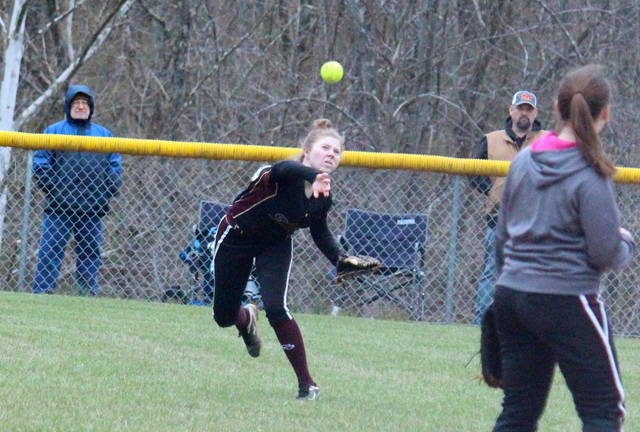 Meigs head coach Bryan Swann noted that Older has stepped into the varsity catching role without his squad missing a beat. In two seasons with the Maroon and Gold, Older has 17 hits, 13 runs batted in and nine runs scored. As a junior, Ciera had a .986 fielding percentage, second-highest on the team among players with at least 10 total chances. Older tied for the most defensive chances on the team with 69 last season. Older will be a part of the rebuilding process for Ohio Valley, which won just five games a year ago, including three in the Great Midwest Athletic Conference. Still, less than an hour from Meigs High School, OVU was just what Ciera was looking for in a college. Older — who holds 3.1 GPA at MHS — plans on an Early Childhood Education major, with plans to enter grad-school after completing her degree.